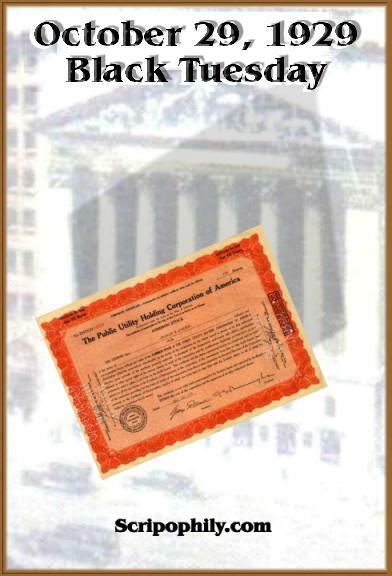 Beautifully engraved certificate from the Public Utility Holding Corporation of America issued on October 30, 1929. This historic document was printed by the American Banknote Company and has an ornate border around. This item has the printed signatures of the Company’s President and Secretary and is over 86 years old. We have only found a few certificates dated October 30, 1929. Most of the people in the securites business were watching the ticker tape machine the day after the market crash. This certificate was issued to an Eternal Optimist who was hoping the market was coming back! This is one you don't want to miss. The 1929 stock market crash is conventionally said to have occurred on Thursday the 24th and Tuesday the 29th of October. These two dates have been dubbed "Black Thursday" and "Black Tuesday," respectively. On September 3, 1929, the Dow Jones Industrial Average reached a record high of 381.2. At the end of the market day on Thursday, October 24, the market was at 299.5 — a 21 percent decline from the high. On that day the market fell 33 points — a drop of 9 percent — on trading that was approximately three times the normal daily volume for the first nine months of the year. By all accounts, there was a selling panic. By November 13, 1929, the market had fallen to 199. By the time the crash was completed in 1932, following an unprecedentedly large economic depression, stocks had lost nearly 90 percent of their value. Stocks lost nearly $16 billion in the month of October or 18% of the beginning of the month value. Twenty-nine public utilities (tabulated by the New York Times) lost $5.1 billion in the month, by far the largest loss of any of the industries listed by the Times. The value of the stocks of all public utilities went down by more than $5.1 billion. The 1920s even had an equivalent of today’s high flying hard crashing Internet stocks. Shares of RCA, maker of radios and phonographs, soared 400 percent in 1928 alone. But by the middle of 1929, many investors had borrowed so much money that the only way to repay loans was to sell stocks. Prices began to fall, and volume began to escalate as brokers demanded cash to cover their potential losses. The Dow Jones Industrial Average went from a low of 191 in early 1928 to a high of 300 in December, 1928 and peaked at 381 in September 1929. Due to the anticipation of continued increases in earnings and dividends,Price/Earnings ratios rose from a conservative 10 or 12 to 20, and higher for the market's favorite stocks. Many observers believed that stock market prices in the first six months of 1929 were overpriced, while some perceived that stocks were cheap. On October 3, the Dow began to drop, declining throughout the month of October. On Thursday, October 24, 1929, the bottom began to fall out. Prices dropped precipitously as more and more investors tried to sell their holdings. By the end of the day, the New York Stock Exchange had lost four billion dollars, and it took exchange clerks until five o'clock AM the next day to clear all the transactions. By the following Monday, the realization of what had happened began to sink in, and a full-blown panic ensued. Thousands of investors -- many of them ordinary working people, not serious "players" -- were financially ruined. By the end of the year, stock values had dropped by fifteen billion dollars. Many of the banks which had speculated heavily with their deposits were wiped out by the falling prices, and these bank failures sparked a "run" on the banking system. Each failed bank, factory, business, and investor contributed to the downward spiral that would drag the world into the Great Depression. This certificate was issued prior to the Public Utility Holding Company Act (PUHCA) cleaning up Public Utility Holding Companies. 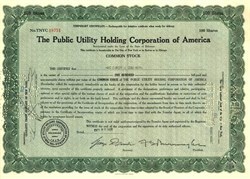 The Public PUHCA was passed during the Great Depression in response to the failure of a number of utility holding companies and subsequent investor losses. Many investors were defrauded due to information problems peculiar to the holding company structure. The utility holding company structure undoubtedly helped disguise unscrupulous practices, such as the bilking of subsidiaries through service contracts, inappropriate depreciation techniques, and the use of inflated property values, all of which contributed to the collapse of the holding companies.